I’ve been feeling a little unadventurous lately so I dug out a peel-back tin of “Made in Taiwan” by Tong Ho Foods Braised Eel in Brown Sauce that I’d bought recently from one of my favourite import food haunts in Birmingham. 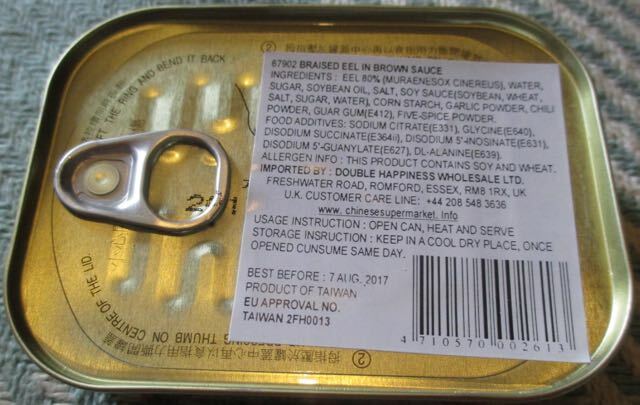 I remember the last tin of braised eel I had went out of date on the “Foodstufffind shelf of adventure” (okay, so I just named it…). I usually keep a good track of snack foods to make sure they don’t go to waste, but braised eel in chilli sauce just seemed to miss my radar. I’ve never tasted eel before and in some parts of England it’s considered a delicacy, but probably not in Wolverhampton. I do like fishy treats though, especially from cans and I do like brown sauce. I know brown sauce isn’t everyone’s favourite sauce (especially Cinabar’s), but hey, I like the stuff anyway! On peeling-back the tin (and trying not to expect sardines) I wouldn’t say the strips of eel were deep filled with brown sauce, rather a reddish liquid sauce at the bottom of the tin. The label had stated to heat the eel, but I went for cold instead (I’m such a rebel). The eel itself was easy to break with a spoon and melted in my mouth, bones and all texture reminiscent of tinned pilchards. There was sweetness to the sauce that really brought out the fishy flavour in the eel. Really very tasty with a medium spice, and don’t be fooled by the brown sauce reference. It certainly didn’t taste of the traditional molasses brown sauce in the UK. Rather like a sweet spicy mild chilli sauce. 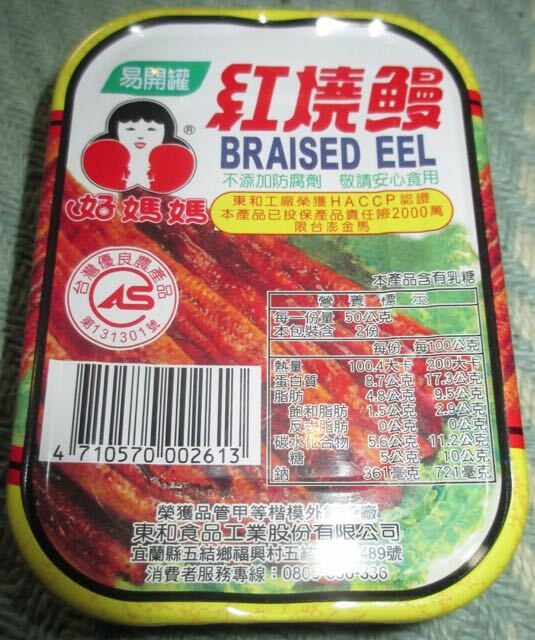 I would recommend this tin of braised eel to anyone. Now I’ve found out that I like eel!